A man rides a fat tire bicycle on Baxter Boulevard in Portland in this March 14, 2018, file photo. CARIBOU, Maine — In a pre-Halloween scary forecast, meteorologists at the National Weather Service in Caribou have issued a hazardous weather outlook for northern and western Maine that includes the potential for measurable snow in northern Aroostook County. Todd Foisy, meteorologist with the NWS in Caribou, said Monday that wet snow and rain Tuesday night is expected to turn to all snow over central and northern areas of the state and continue into Wednesday morning. 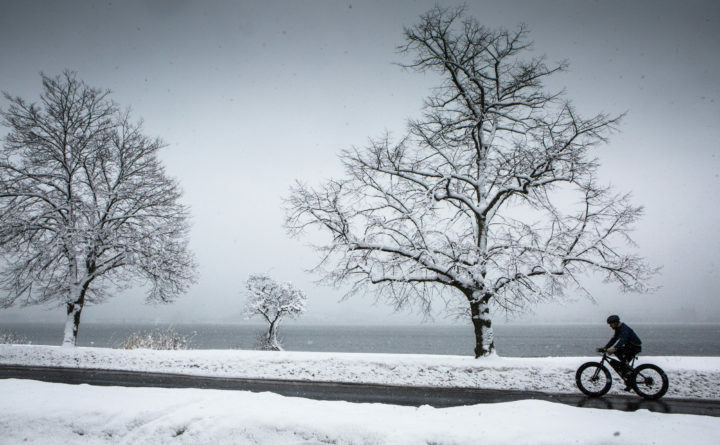 The Bangor Daily News is pleased to feature content from our sister website, The County. To read the rest of “Snow predicted for some parts of the state this week,” an article by The County staff writer Jen Lynds, please follow this link to The County online.